Luxury Chocolate truffles hand rolled in a secret cocoa recipe, blended with fresh cream, dipped in dark chocolate, and dusted in pure cocoa. 12 deliciously creamy dark chocolate truffles freshly hand rolled using our very own secret recipe of cocoas from around the world blended with the very best Cornish and Hampshire creams. Each truffle is then hand dipped in our award winning 71.1% CacaoLux couverture chocolate before being dusted with pure cocoa powder. This is the recipe we used with Kirstie Allsopp who came to visit us to set out to learn the art of chocolate making as part of her 'Kirstie's home made Christmas' special programme. 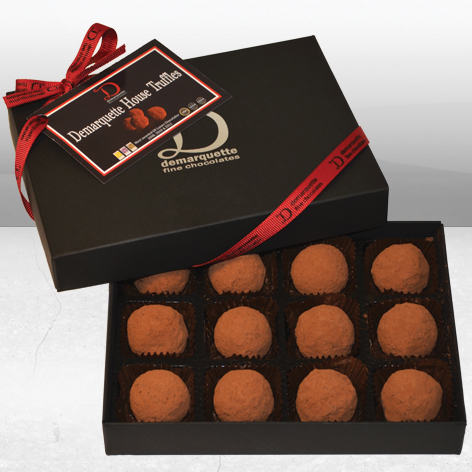 Each box contains 12 Chocolate Truffles.